It's cold. And, I'm hungry. The collective six pm vibration on the tram home starts a sequence of daydreams on imaginary wood burners magically inhabiting the flat by the time I return. 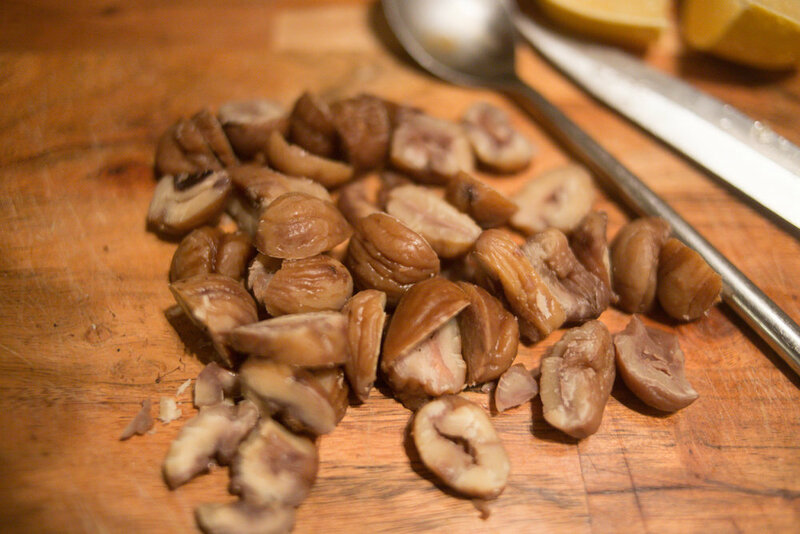 Radiators are a good enough substitute and; reality is made cosier on remembering the ready-to-eat chestnuts I have stashed in the cupboard. My resolve to cook dinner is renewed with winter cheer. We have two squash that need eating, so they are going in. Roasted is, in my opinion, not just the tastiest, but the easiest. It can also be the prettiest if you use them as below; an earthy decorative topping to what is essentially a bowl of heavenly mush. Arborio and other white rices are delicious no doubt, but they can be challenged in the taste test by the nutty, creamy texture of wholier options. Turn your head to brown rice or quinoa or buckwheat or....Millet. On top of being delicious, quick-cooking and perfect for risotto because of how easily it gives a creamy consistency, it is full of iron, calcium and B vitamins. Naturally gluten free and, one of the least allergenic, easily digestible grains available. Good. Now let's make it. Chop squash in half, use a spoon to remove the seeds. Slice into 1 cm thick pieces. In a roasting tin put 1tsp of coconut oil and let that melt. 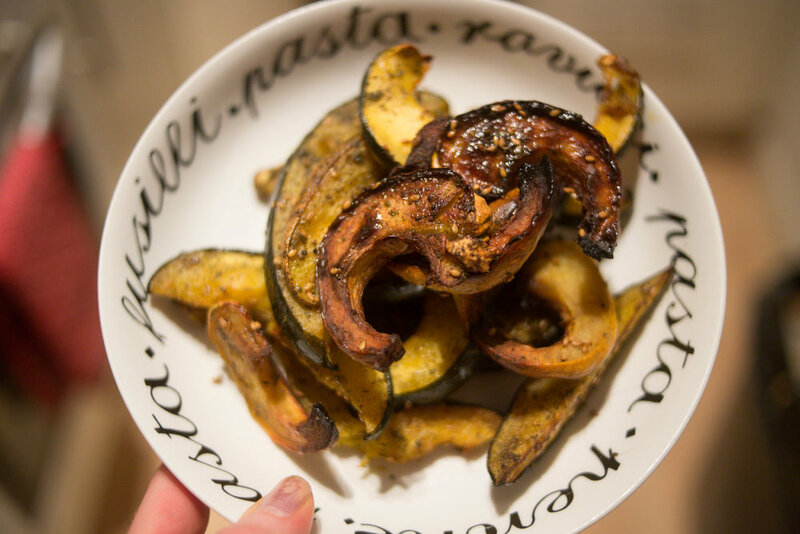 Place your sliced quash on the tray and sprinkle with a little salt and a fair bit of za'atar. Oven will be perfect on 180 degrees, after 15 mins, turn the slices over and sprinkle the other side in the same way before returning to cook for a further 15 -20 minutes. Dice the onion and slice the leek. Fry in some coconut oil in a large pan until starting to golden. Add the millet and stir continuously for 1 - 2 minutes. This draws out a nuttier flavour. In a large pyrex jug mix the bouillon with 1 litre of boiled water. 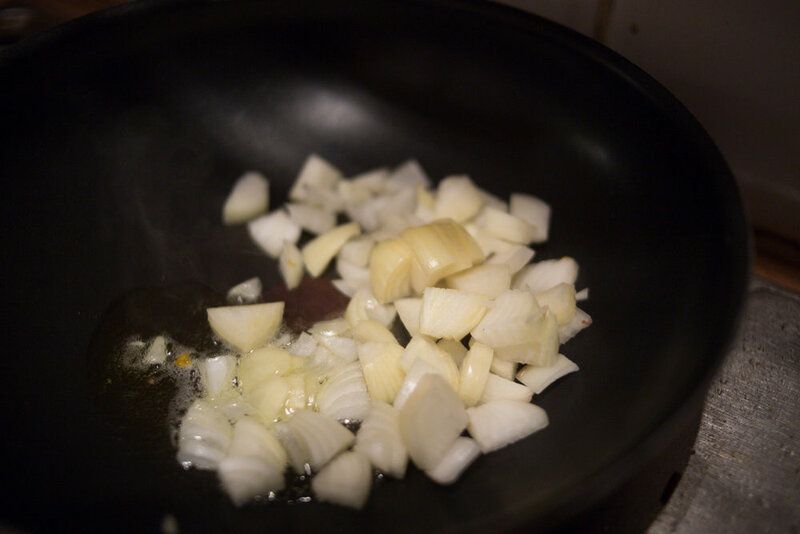 Add this a ladle at a time to the risotto, stirring often, for the next 20 - 25 minutes. After about 10 minutes of cooking, add in your mushrooms, chilli and crushed garlic. Keep stirring, keep adding your stock one ladle at a time. See that millet getting flufflier? Great, not long to go now. In a dry frying pan, toast the pumpkin seeds for a couple of minutes. Leave to one side in a bowl for sprinkling on at the end. *Pumpkin Seeds* are rich in zinc, magnesium, omega-3 and omega-6 fatty acids, antioxidants and fibre. A great habit is to start sprinkling these on...everything? From your morning porridge to a weird pizza; where there's a will there's a way and all that. Seriously they taste great too. Okay it's probably time to check how the squash is doing. If it looks all crispy on the outside, soft on the inside etc then leave them in the oven but turn the heat off so they keep warm ready for placing on top of the risotto. 20 minutes of risotto cooking has passed now, so add in your chopped chestnuts. Try the millet. Is it soft and delicious? No? Needs a little longer, right okay. 25 minutes of risotto cooking. How's that millet now? Soft? When nearly all the stock in the pan has been absorbed then add the coconut milk, stir in. Now add the juice of half a lemon and stir. Taste. You want to taste the lemon but not for it to be overpowering. If it needs a little more then add another quarter, keep going until it's to your liking. 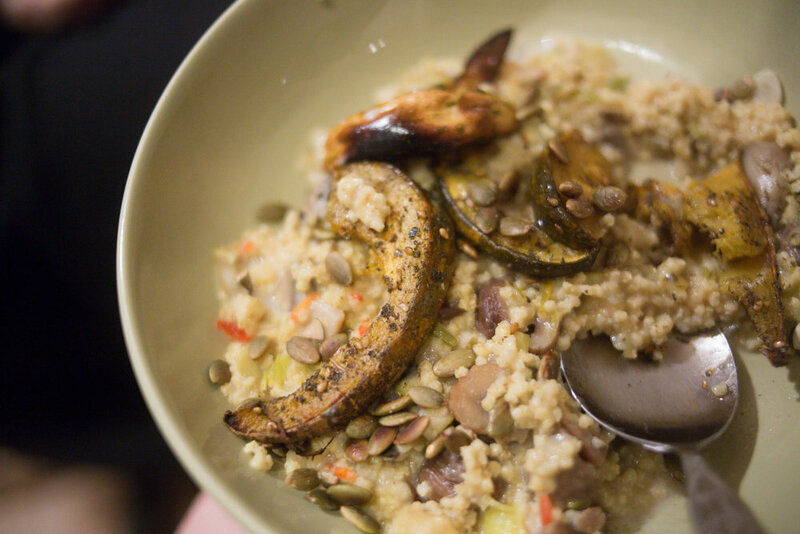 You're ready to serve up now, so in the bowl you want a hearty scoop of risotto, few slices of roast squash on top. A tbsp of coconut milk drizzled over the top, then a sprinkle of pumpkin seeds to finish.